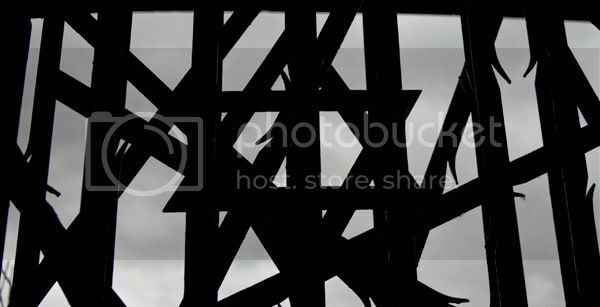 For more pictures of Dachau and Germany, click here. Only 20 minutes ago did I walk through the gate marked Arbeit Macht Frei, those heinous words that marked the entryway to Dachau. It hasn’t been long enough for me to be crying yet. The tears subside. 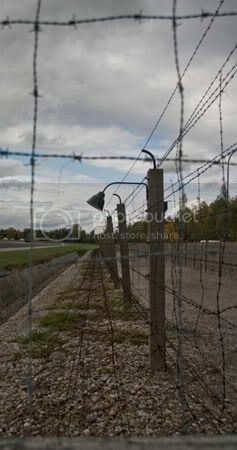 Up ahead is a barbed wire fence, a trench, a guard tower and gate that defined the boundary of Dachau. Occasionally it was known as the “suicide zone” because people who couldn’t take the life anymore would walk into the kill zone that marked the edge of the camp. But after a few steps, I’m not paying attention to the brutal area I’m about to walk into. I’m thinking about why I didn’t want to cry. If anything is worthy of my tears, the death and mistreatment of millions is. I cried when I visited the Holocaust Museum in Washington D.C. as a child. Why not now? Why not as I walk the same ground in which over 200,000 Jews, Catholics, Poles, Russians, and prisoners of a political sense were systematically broken, tortured, or killed? The barbed wire wraps lazily in circles, the rusted roof of the guard tower glows the same colors of the beautiful Bavarian fall that surrounds us. The sky has, for the most part, been overcast and down. I appreciate that. It matches the mood. It sets the tone. I kneel beside the trench and tilt my camera. The angle, I know, is more artistic than documentarian, the barbed wire looping lazily across the straight lines of trench. It’s beautiful and terrible. Why am I doing this? Why am I making art out of this? All around the camp are these stunning pieces of art. There’s a skinny, emaciated man taking a step by the crematoriums. There’s a beautiful wooden chapel dedicated to the Russian prisoners of war killed here. There’s a large piece of metalworking depicting bodies twisted up like barbed wire. And they’re beautiful. And they’re poignant. And they’ve done exactly what I’m doing. By taking this artistic approach, it allows me to separate myself from the horrors. If I didn’t know what happened here and I looked at one of my pictures, would I be able to tell? Probably not. The items and angels certainly strike with a bit of sadness, but it inspires contemplation rather than outrage. It intellectualizes the entire ordeal. Maybe that’s the only way to do it. Maybe I simply can’t handle the full brunt of reality, breaking me down, leaving me in tears, and shredding a little part of my soul. I walk through the bunk houses. They aren’t the real bunk houses; they’re recreations. Along the walls are quotes from prisoners talking about the ordeal of living here: the breaking down of the rooms, the incessant cleaning, the tight schedules, the cramped quarters. It’s not hard to imagine, not with the pictures on the walls. The place has a sterility to it. It’s clinical and detached, just like my photographs. Maybe that’s how the Nazis did it. Maybe my photography is simply another way to dehumanize the event. I cringe at the thought and quickly wipe it from my mind. 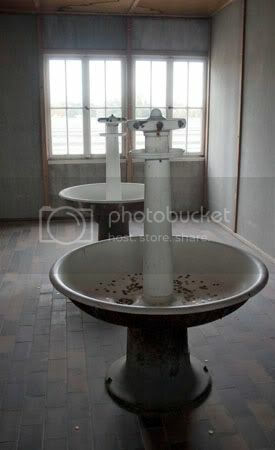 In one of the washrooms, the communal sinks are filled with coins like a wishing well. Maybe they’re urinals. I suddenly can’t tell. It seems morbid with the gleaming coins flickering in the bowl. Each room, from the bathrooms to the lockers to the bedrooms, has been designed to fit a specific era of the camp. After all, Dachau was built in 1933. It was originally billed as a “protective custody camp” for political prisoners. The Nazis regularly staged tours for higher ups and the media to show how good conditions were. Despite this, many people knew of the atrocious treatment within a few years, and though word was slow to get out, there was a general understanding that bad things were happening. A New Yorker in a Yankees cap stops me was I walk down one of the aisles beside the leftover foundations of the bunkhouses. “Could you take my picture?” he asks, his thick accent placing him instantly. He slips off his cap as he poses. I take a couple shots and hand his camera back. We smile and go our separate ways. “It’s hard traveling alone,” he says with a shrug as he walks off, the dourness of the subject matter once again returning. I feel altogether too civilized. I should have commiserated and traded stories. I should’ve learned what I could about why he came and why he’s doing it alone. I get the feeling that visiting a concentration camp is something I’d be doing alone even with other people. When our group first got here, Matt suggested we split up. I was grateful for that. I didn’t want to joke or pal around or be social while trying to deal with the depth of tragedy. Though I’ve seen my companions occasionally, we say nothing and merely pass. Even the French couple has divided during their journey. The Krematorium, as the sign proclaims, is off to the side down a small path that crosses a stream full of long green tendrils that waver in the current. The Old Crematorium is brightly lit and open to the outside, the New Crematorium clinical and enclosed. Off to the right is a gorgeous grove a trees. A path through them takes me by walls and ditches where executions took place. The light filters through the foliage as if rays from heaven were being sent directly. A pile of slate marks where they kept the ashes. Birds are singing. It’s a strange disconnect. Here is the waiting room, the windows allowing plenty of sun to make people feel comfortable. My camera clicks as I snap a picture. Here is the gas chamber. The gas distribution system was never properly used, though a few people were killed with gas in the room. Most prisoners marked for euthanasia were shipped to Hartheim near Linz, Austria. My camera clicks again. I’m starting to disgust myself. 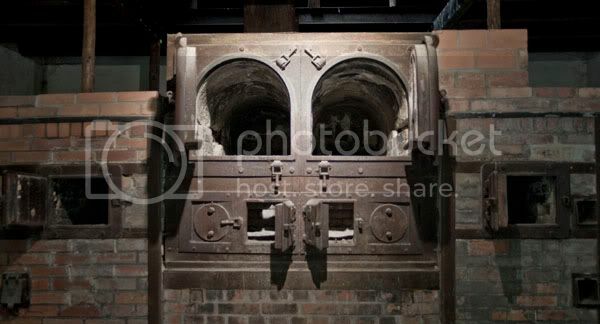 Here are the ovens. The Old Crematorium could only deal with 11,000 people between 1940 and 1943, so they built this more efficient one. To further speed things up, people were hung on the rafters right in front. By the end, they didn’t have enough fuel to burn all the bodies, despite burning 4 or 5 to a tray. My camera takes another picture. I’m not even sure I’m in control of it anymore. It seems to be going of its own volition, my hands moving in time with the cogs of the machinery. 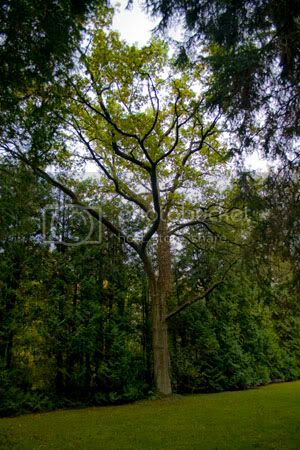 I wander back into the grove, basking in the fresh air. My camera disappears into a pocket. At one point, the city of Dachau was known for art, for its beautiful streets, and for its grand baroque palace. But that was before the National Socialist party made it home to the first concentration camp. Suddenly everything the city of Dachau had to offer disappeared behind the atrocities of the holocaust. Never again would someone say the name and think of the magnificent medieval palace that had been home to dukes and kings. Instead, the beautiful little city would be overshadowed by the small portion of land sown with the seeds of death and destruction. I pass through the protestant church. It was a controversial move to build a protestant church here, as protestants were rarely, if ever, kept or killed here. The grey stone is cold and morbid, just like every other memorial building. I pass out the back and walk passed a convent attached at the back wall on my left. To my right is a large tower with a cross and a giant bell that rings on the hour dedicated to the Polish men and women who died. Further up is a Jewish memorial topped dug into the ground, a stone menorah standing atop a small open well that drops light into the main cavern. The gates have stars of David wrapped trapped in a network of mock barbed wire. Candles flicker in the light before Israeli flags. The center aisle of the bunkhouses leads toward the museum. Each bunkhouse is labeled with a stone slab marking its number, its foundation filled with rocks. I hope silently that those rocks were left by mourners, as is the Jewish tradition. Besides several of the bunkhouses are signs telling me the facts. One side was all housing. The Jews were kept separately from the others and always worked the hardest jobs. The other side included medical buildings used for treatment and experimentation. SIDE NOTE: I’ve always had a strange sense of pity for the Nazis. Don’t doubt for a minute that this would’ve stopped me from taking up arms against them or trying my damnedest to try and stop them when I was alive then, but I also don’t think that they can be condemned on an individual basis. The things their doctors accomplished and learned are benefiting us today, atrocious as the experiments might have been. The people wrapped up in the fervor of the moment occasionally did momentous and important things. Should that forgive them for their sins? Probably not. But on a personal level, I can’t hold it against them. I’d rather concentrate on the good that’s come from it and concentrate on preventing anything of the sort from happening than sit around talking about revenge, penance and punishment. Let them sort out their sins with their gods. The rest of museum houses collections of documents and audio recordings. It has panels dedicated to SS leaders, to the movement, and to concentration camps across Europe. It has a map detailing where people at Dachau were from, including the solitary prisoner from Angola. It has boards dedicated to the media spin control the Nazis perfected long before the US did. It has board dedicated to the resistance in the camp and the smuggling of materials out. It has a documentary that shows the camp at the end and the liberation, its words disconnected from images at times, distancing itself from the menace. It has plaques and statues dedicated to those who died, those who fought, and those who couldn’t do either. At the rear of the museum, a sign points to the Bunker. The Bunker was a prison within a prison. Unlike solitary confinement, the prisoners here were usually treated better. The Bunker is dark. Its hallways barely lit. A few rooms contain books brimming with documents and pictures. Cells have had their doors removed and projectors light up walls with quotations and facts. The very last room houses a portable altar for the priests. There are bars on the windows and doors. They were put here by the Americans after the fact. This building was used to house war criminals and interrogate Nazis. My camera has fallen silent. What good is it to liberate a camp only to use it again? I walk back around front. A raven greets me on the roof top. It seems fitting to me. 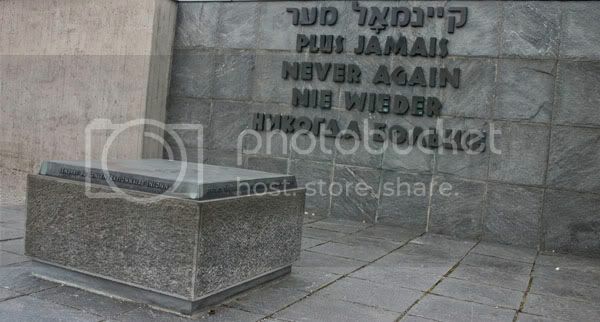 I walk passed the large marble slab marked “never again” in five language. I pass the colorful chain memorial, a tour group in front listening as the guide explains that it’s missing colors for thieves, murderers and gays. I pass the barbed wire memorial, the human shapes blending into the metal. The large memorial sign glares at me as I stop between it and the main gate. 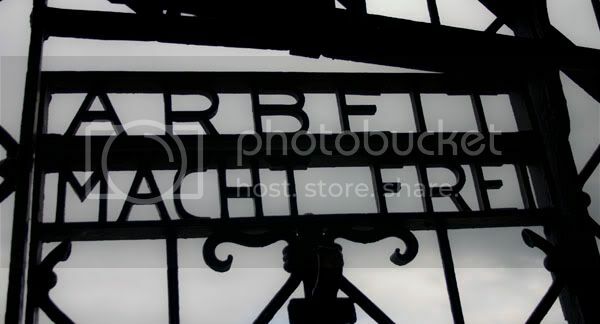 Its words remind me that Dachau was a concentration camp but is no longer. Forever more, it will be a place of remembrance. “May the example of those who were exterminated here between 1933-1947 because they resisted Nazism help to untie the living for the defiance of peace and freedom in their respect for their fellow men,” it reads. On top sit a motley collection of rocks. just found a scrap paper with ur blog on it- I’ll keep in touch. -manus (we met in jaisalmer). Yeah, I have a scrap somewhere with your email on it. I keep meaning to dig it out and drop you a line.